A cultivar of Jasminum sambac (L.) Ait. The species is a frost-tender, evergreen twining climber or scrambler of bushy growth, with lustrous leaves in whorls of 3 or opposite, and small cymes of 3-12 salverform, strongly-scented white flowers, 2.5cm across, fading to pink, mainly in summer. ‘Grand duke of Tuscany’ has double flowers, like miniature gardenias. To 3m. [RHSE]. ‘This is a native of India, where it is much cultivated for the delicious fragrance of its pure white flowers, which are produced in succession for a great part of the year. They are used by the Hindoos in their ceremonies, and are universally esteemed.’ [LBC No.922/1833]. 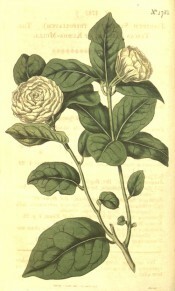 ‘The large, full variety, known among gardeners by the name “Tuscan Jasmine”, acquires a much broader disc with a shorter tube, by the filling of the flower. The bloom of this is strung by the females of India in the evening of the day into chaplets and necklaces. Sambac is the Arabian appellation of our plant.’ [BR f.1/1815]. ‘The Kudda-Mulla of the East-Indies differs from the other varieties of the Arabian jasmine in so many points, that we have hesitated whether we should regard it as belonging to that species. […] It was said by Miller to have been in the royal garden at Hampton-Court at the end of the seventeenth century; but it was little known in Europe till it was imported from the East-Indies to the garden belonging to the academy at Pisa, about the year 1691; being, with the common double variety, the only plant that survived the voyage, out of sixteen chests sent from Goa. These, as soon as they were sufficiently recruited, were removed to the garden of the Grand-Duke.’ [BM t.1785/1815]. ABR pl.497/1807. Listed only in the 1857 catalogue [T.596/1857]. Jasminum sambac var. flore pleno Andr.